Our Friday Night Action tournaments are always fiercely contested. This week was no exception as four players all rated over 2000 battled it out. 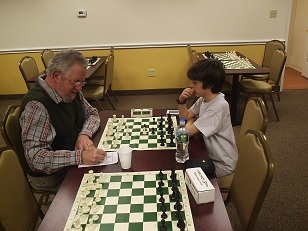 The only master in the group, Daniel Lowinger, seemed on track to a clear victory after winning his first two games. However, rising star Nicolas Checa put an end to his run in the final round. Having lost earlier to Alex Eydelman, this final round win by Checa created a three way tie for first!